Campoformido in February - March 1942. From left: Petrosellini, Giuseppe Oblach, Tenente Vittorio Squarcia, Aldo Gon, Generale Piacentini (who had flown SM 79s in the Italian East Africa (A.O.I. )), Sergente Maggiore Rossi, Teresio Martinoli, Gino and Alvaro Querci. Santo Gino was born on 29 April 1917 in Romentino, Novara. In August 1940, Sergente Gino served in the 73a Squadriglia of the 9o Gruppo C.T., which was equipped with CR.42s. The 73a Squadriglia included Tenente Vittorio Pezzè (CO), Tenente Valerio De Campo, Tenente Giulio Reiner, Tenente Pietro Bonfatti (assigned in the end of July), Sottotenente Giuseppe Oblach, Sottotenente Carlo Battaglia, Sottotenente Alvaro Querci, Maresciallo Mario Ruffilli, Maresciallo Alberto Montanari, Maresciallo Norino Renzi, Maresciallo Corrado Ranieri, Sergente Maggiore Guglielmo Biffani, Sergente Maggiore Enrico Dallari, Sergente Maggiore Sergio Stauble, Sergente Maggiore Antonio Valle, Sergente Gino, Sergente Lido Poli, Sergente Pasquale Rossi, Sergente Mario Guerci (still in training) and Sergente Armando Matacena (still in training). Participating pilots were Romagnoli, Capitano Giuseppe D’Agostinis (CO 91a Squadriglia), Tenente Enzo Martissa (91a Squadriglia), Sergente Aldo Rosa (91a Squadriglia), Tenente Giovanni Guiducci (CO 90a Squadriglia), Sergente Maggiore Angelo Savini (90a Squadriglia), Capitano Luigi Monti (CO 84aSquadriglia), Tenente Vittorio Pezzè (CO 73a Squadriglia), Tenente Valerio De Campo (73a Squadriglia), Sottotenente Carlo Battaglia (73a Squadriglia), Sottotenente Alvaro Querci (73a Squadriglia), Maresciallo Norino Renzi (73a Squadriglia), Sergente Maggiore Enrico Dallari (73a Squadriglia), Sergente Antonio Valle (73a Squadriglia), Sergente Gino (73a Squadriglia) and Sergente Lido Poli (73a Squadriglia). It seems that the 73a Squadriglia suffered most from the surprise attack, losing five aircraft when Sergente Maggiore Enrico Dallari and Sergente Antonio Valle baled out (possibly shot down by Sykes and Linnard), Sottotenente Querci and Sergente Gino force-landed and Maresciallo Norino Renzi failed to return. Sergente Lido Poli was hit early in the fight, being severely wounded in the left arm. Despite this, he continued to fight, claiming to have shot down one Gladiator before force-landing close to an infantry unit at the outskirts of T3 airfield. A patrol from the army immediately took him back to El Adem. Then he was send to the navy hospital of Tobruk where his arm was amputated. For this courageous display, he was awarded the Medaglia d'oro al valor militare. The official citation of his award stated that he “shared in the destruction of five enemy fighters”. His aircraft was recovered lightly damaged as also stated in the same citation: “he succeeded in landing his plane without damage”, forced only by the loss of blood caused by his wound. The Italian formation was composed by 18 aircraft from all three Squadriglie of the 9o Gruppo led by Maggiore Ernesto Botto (at the head of the 73a Squadriglia). Six of the CR.42s were from the 96a Squadriglia (Capitano Roberto Fassi leading Tenente Aldo Gon, Sottotenente Carlo Agnelli, Sottotenente Armando Moresi and Sergente Vittorio Pozzati together with 4o Stormo’s adjutant, Capitano Mario Pluda), five were from the 73a Squadriglia (Tenente Valerio De Campo, Tenente Pietro Bonfatti, Maresciallo Mario Ruffilli, Sergente Maggiore Antonio Valle and Sergente Gino) and six were from the 97a Squadriglia (Capitano Antonio Larsimont Pergameni, Tenente Ezio Viglione Borghese, Sottotenente Jacopo Frigerio, Maresciallo Rinaldo Damiani, Sergente Francesco Putzu and Sergente Franco Sarasino). They had taken off from El Adem at 14:40 to cover Italian troops in the Bir Enba area (and probably indirectly escorting a reconnaissance plane) when Botto discovered a Bristol Blenheim escorted by several Hurricanes flying lower and attacked. In the afternoon on 9 December, SM 79s were out to bomb British troops at the Sidi Barrani - Bir Enba area. They were to be escorted by 19 CR.42s of the 9o Gruppo led by Maggiore Ernesto Botto, which had taken off from El Adem at 14:55. The fighters included seven from the 73a Squadriglia (Tenente Valerio De Campo (CO), Tenente Giulio Reiner, Sottotenente Alvaro Querci, Sergente Maggiore Guglielmo Biffani, Sergente Maggiore Enrico Dallari, Sergente Maggiore Antonio Valle and Sergente Gino) seven from the 97a Squadriglia (Capitano Antonio Larsimont Pergameni (CO), Tenente Ezio Viglione Borghese, Sottotenente Riccardo Vaccari, Sergente Maggiore Otello Perotti, Sergente Maggiore Massimo Salvatore, Sergente Angelo Golino and Sergente Alcide Leoni) and four from the 96a Squadriglia (Tenente Aldo Gon and Sergente Giuseppe Tomasi together with two unknown pilots). At 15:05 on 13 December, Capitano Antonio Larsimont Pergameni again led a patrol with four CR.42s from the 97a Squadriglia (Tenente Ezio Viglione Borghese, Sergente Maggiore Raffaele Novelli and Sergente Alcide Leoni), eight from the 73a Squadriglia (Tenente Valerio De Campo, Tenente Pietro Bonfatti, Sottotenente Giuseppe Oblach, Sottotenente Alvaro Querci, Sergente Maggiore Enrico Dallari, Sergente Maggiore Sergio Stauble, Sergente Maggiore Antonio Valle and Sergente Gino) and eight from the 96a Squadriglia to make a ground strafing against a British convoy in the Sollum-Buq-Buq area. While returning one Hurricane was attacked and claimed damaged, apparently by a 73a Squadriglia pilot. They returned to T3 at 17:05 claiming nine armoured vehicles (five in flames and four damaged). 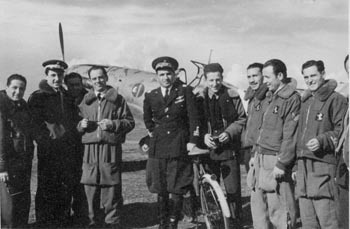 On 4 April 1941 the 73a Squadriglia (Capitano Mario Pluda (CO), Tenente Pietro Bonfatti, Sottotenente Giuseppe Oblach, Sottotenente Alvaro Querci, Maresciallo Mario Ruffilli, Sergente Antonio Valle, Sergente Gino, Sergente Rossi, Sergente Mario Guerci, Sergente Maggiore Giovanni Gallerani (96a Squadriglia) and Sergente Maggiore Raffaele Novelli (97a Squadriglia)) was transferred to Alture di Pola. On 9 April Capitano Mario Pluda, Tenente Pietro Bonfatti, Sottotenente Giuseppe Oblach, Maresciallo Mario Ruffilli and Sergente Gino, protected by MC.200s of the 84a Squadriglia, attacked thirteen seaplanes at Slosella harbour (now Pirovac). Eight seaplanes were claimed as sunk and two more on the ground were damaged. AA fire damaged Pluda’s aircraft in the right wing and Bonfatti’s in the tail. The mission was repeated two days later when Pluda led eight aircraft. Bonfatti, Oblach and Gino attacked the seaplanes while Pluda and the rest of the squadriglia strafed AA sites. Three seaplanes were burned and two were severely damaged. 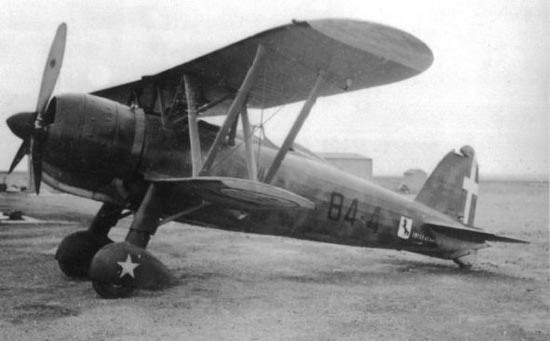 On 27 September the whole 9o Gruppo, now equipped with brand new Macchi MC.202s, left Gorizia and flew to Rome-Ciampino, where they two days later met Il Duce, Benito Mussolini, which greeted them. Later the same day they went to Comiso (Sicily) for a new tour of duty, this time against Malta. At this time the 73a Squadriglia was composed of Capitano Pluda (CO), Capitano Carlo Ivaldi, Tenente Pietro Bonfatti, Sottotenente Giuseppe Oblach, Sottotenente Felice Bussolin, Sottotenente Alvaro Querci, Sergente Maggiore Enrico Dallari, Sergente Gino, Sergente Rossi, Sergente Mario Guerci, Sergente Maggiore Teresio Martinoli and Sergente Armando Angelini. Gino ended the war with 5 shared biplane victories. Santo Gino died on 5 July 1998. Biplane victories: 5 shared destroyed, 1 probably destroyed, 4 shared damaged. TOTAL: 5 shared destroyed, 1 probably destroyed, 4 shared damaged.